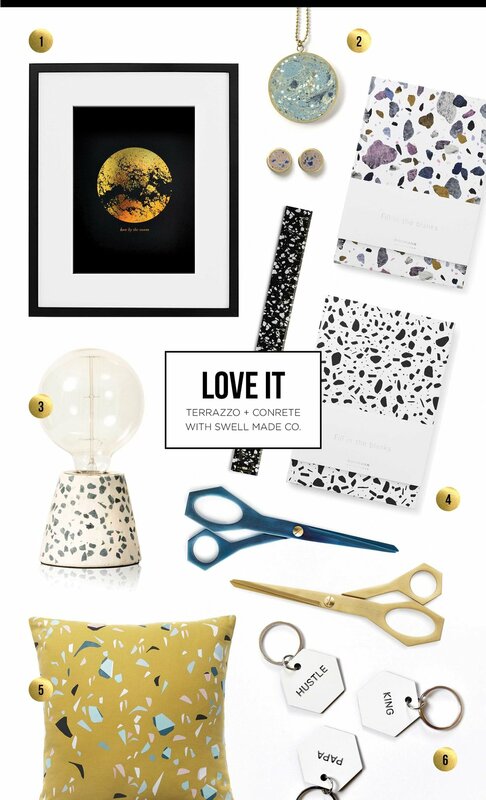 LOVE IT | Terrazzo + Concrete with Swell Made Co.
For this edition of LOVE IT, it's time to look at the comeback (or emergence) of the terrazzo and concrete trend. Seen on floors of the schools and subway stations of the 1970s, terrazzo is making its way into homes, restaurants and inspiring accessories. Terrazzo was "invented in 15th-century Venice as a way of using up marble remnants. Composed of chips of marble, granite, quartz, and/or glass suspended in a cement or polymer binder, terrazzo is extremely durable". Read more about the comeback on Apartment Therapy. Love By the Moon 11x14 Art Print by Swell Made Co.
Chromas Pendant + Oculus Studs by Beton Brut. Canadian maker, Beton Brut, creates stunning concrete jewelry. Made with an array of pigments and semi-precious stones mixed in micro batches. Ettore Table Lamp from Oliver Bonas. This simple statement piece made from concrete is a perfect way to light a room. Terrazzo Stationery by Normann Copenhagen. These fun pieces of stationery pay tribute to terrazzo with notebooks, rulers, pencils and even scissors. Neutral and natural gem coloured palettes give this Daily Fiction series a distinct look meant to tempt and delight design lovers. Terrazzo Mustard Cushion by Rebecca Judd Loves Home Republic. This graphic pillow brings the terrazzo look into your home without the commitment of flooring. Plus, it's a softer too. Hex Keytags by Swell Made Co. Minimalist hex keytags that say it all. Also available in triangles. Here is some more inspiration for you. Toronto's new Cafe Cancan, with interior design by Tiffany Pratt, features rainbow terrazzo flooring. Combined with soft pinks, flamingos and French cuisine, this cafe is an Instagram and culinary dream. Holly Young, Canadian artist, interior design lover and blogger, has a new collection that reminds me of terrazzo with abstract shapes and soft, summery colours. Check out the collection here. These stairs go retro at Paradiso, a cafe in Geneva. Combined with brass fixtures and extreme attention to details, this cafe transports you to Italy. Check out Pinterest for a bunch more terrazzo + concrete goodness. Finally, another concrete maker from Canada, Concrete Cat. Pioneers in making concrete cool, they have a unique collection of concrete goods including the tile below and even a baseball bat. They explore the use of concrete with a focus on colour, pattern and form to create magical pieces of art and furniture.